Two up and two down. 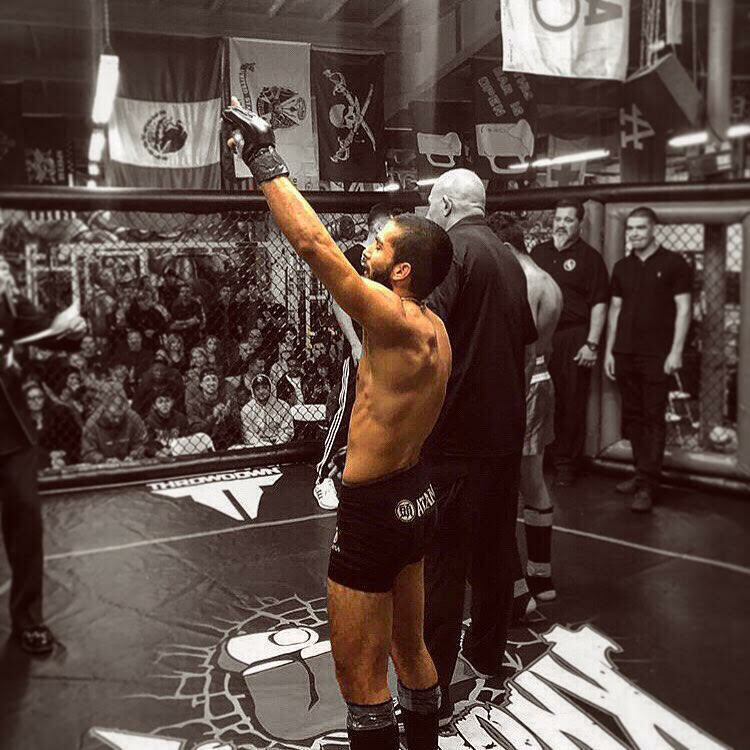 Strikers, Inc. mixed martial artist and Studio Physique frequenter, Marino Napuri, remains undefeated since his anticipated transition from kickboxing to MMA (mixed martial arts). Napuri prevailed in his inaugural bout last month via technical knockout in the third round, and he imposed a similar conclusion to his most recent fight this month, winning by TKO in only the second round. Unlike his debut fight, however, the second contest was Napuri’s first outside of a traditional boxing ring and into the iconic octagon... and while the second competition was shorter in duration, it far outpaced the first in intensity and against a more formidable opponent to boot. Napuri’s opponent opened the fight with an impressive barrage of lengthy combinations. Weathering the storm, Napuri used that first round to test the waters, returning to his corner after the first bell where he and his coaches put their heads together to map out a game plan. “I told him, hey, this is great news! It’s a kickboxing match! He wants to kickbox, so let’s kickbox! This is your world”, explains Napuri’s head coach and Strikers, Inc. founder, Joseph Del Real, appealing to Napuri’s proficiency and experience as a striking artist. To give context, Napuri’s first MMA fight transpired largely on the floor, where Napuri was forced to employ his more recently acquired skills of grappling, wrestling, and Jujitsu to prevail - ultimately passing that test by leveraging himself into a contest-ending “ground and pound” position. In contrast, the fight at hand, as pointed out by coach Del Real, was right in Napuri’s wheelhouse, and the team took full advantage in the second round. Met with another flurry of punches and kicks, Napuri demonstrated patience and poise with his back against the cage as he picked his moment for a devastating counter punch followed by an explosive combination that merited the referee’s intervention to stop the fight, delivering Napuri his second straight TKO victory. “I really think he knocked him out with that first counter punch” says Coach Del Real, reflecting on the night’s pivotal moment. Both fighters have MMA records that are in their infancy and that belie their respective levels of experience. While Napuri holds experience in the kickboxing world, the team discovered only after the fight that their opponent had been competing at the professional level overseas, making this victory all the more impressive for Napuri and Strikers, Inc.. Behind Napuri’s energy and explosiveness in the ring was an increased attention to and diligence with his nutrition. Collaborating with Studio Physique nutritional resources Laura Derr and John Harewood proved to reinforce Napuri’s elevated nutritional habits. As a result, Napuri had more lean muscle mass and energy stepping into the ring after his weight cut than in previous attempts.